Album Info: These are scanned Kodachrome slides I took. Description: A brick working as a yard switcher at Shops Yard. Description: Of no use to their new owner, two C424's await their fate on the roundhouse whisker tracks. 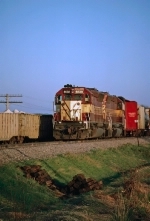 Description: An ex-GBW 50' plug door box relettered for the Iowa Traction. Description: Recently purchased ex-KI&T SW1500 sits on the roundhouse whisker tracks. 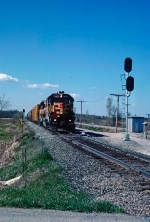 Description: Looking east - the ex-FRVR/CNW main is on the left, an ex-SOO signal is in the foreground, the rebuilt crossover from the Black Wolf Sub to the Neenah Sub is in the middle, and the Neenah Sub is on the right. Description: In a power move at Lakeshore Dr. 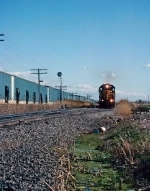 Description: Train 2 approaches Tower CF. Description: Train 2 slows for the switch at Tower CF to cross over to the Black Wolf Sub. 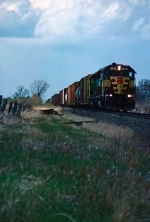 Description: Train 2 starts to cross over to the Black Wolf Sub. from the Neenah Sub. Description: Train 2 heads down the Broad St. trackage on the Black Wolf Sub. Description: Train 2 heads for the Fox River Bridge on the Black Wolf Sub. 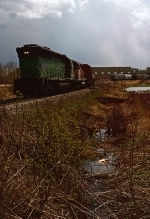 Description: Train 2 approaches the crossover at Black Wolf on the Black Wolf Sub. 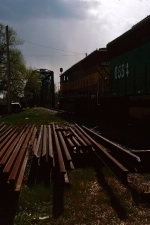 Description: Train 2 crosses over to the Neenah Sub. from the Black Wolf Sub. Description: Train 2 passes the wig-wag protecting the Neenah Sub. 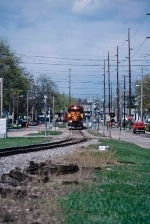 Description: Train 2 approaches Shops Yard on the Neenah Sub. 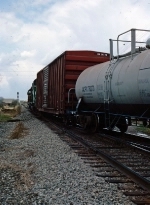 Description: An ex-North American cylindrical covered hopper. 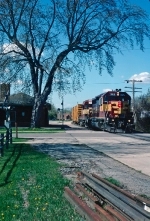 Description: The 18th Ave. depot sits on the (compass) west side of the Neenah Sub. main line. The Griswold crossing signal is ready to stop vehicle traffic. 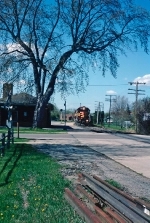 The West Oshkosh switch just west of the depot has been removed. Description: Relettered box car in Shops Yard. Description: Working Shops Yard at Lakeshore Dr. Description: Train 20 ambles past the 18th Ave. depot. Description: Train 20 hustles down the Neenah Sub. Description: Train 20 approaches Shops Yard at Subway Rd. Description: Train 45 waits on the main at Byron. 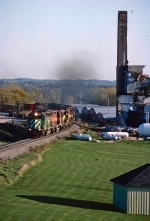 Description: Train 47 heads west past a demolition site. Description: Train 47 heads west on the Chicago Sub. Description: Train 47 pulls down the Byron siding. Description: With most of the power off #47 the crew pulls west of the West Byron switch before dying on time. Description: With the lead 7 units off #47 and the unit off the house track, 10 WC motors are about to lead #45 to Shops Yard. Description: 10 motors lead #45 down Byron Hill to Shops Yard. Description: Train 43 starts out of Valley Siding for the last lap to Shops Yard.